As you know from using your slow cooker/crock-pot, it does more than merely cook. This handy kitchen appliance will cook meat fork tender and cook desserts. Rice can also be cooked in slow cookers. You’ve probably used it to make cooked cereals, soup, chili, veggies, and pasta. To keep your slow cooker in tip-top shape it must be cleaned after each use. With no effort at all, it will always be clean for your next meal. Rice will double in size cooked in a slow cooker. If you want a rice cooker for rice, see our best superb units. Slow cookers are especially wonderful for cooking those comfort foods we all love in the winter. It’s winter where I am now snowing today, and I’m getting my cooker out to make green chili to smother burritos with. Always read the instructions that came with your slow cooker. 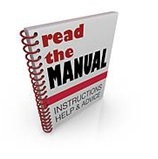 If you don’t have it, you can find manuals online using the model number on the bottom or side of your unit. 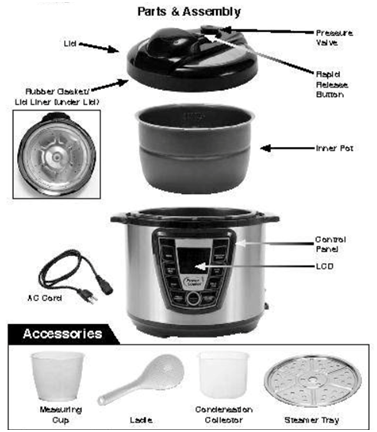 Different brands and models of slow cookers have different instructions for cleaning and maintenance. Usually, slow cookers Do not boil over when set to the proper temperature to cook slowly for 8- to 10-hours. If it does, read the tips below for cleaning. Most of today’s slow cookers have some parts that go into the dishwasher. But if not, try these methods. 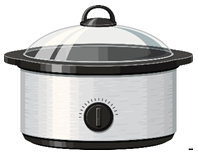 Slow cookers can have outside housings that are glass, ceramic, plastic, aluminum and stainless-steel. Be sure you clean it the way your manual states for its materials. The housing never goes into the dishwasher and is never immersed in water. Step 1. Wait until the cooker cools to the touch and unplug it from the wall and the cooker, unless it is hard wired to the unit. Be sure all the old food is out of the interior pot. Never submerge the pot into water with electrical plugs; the electronics will be ruined forever. Step 2.Cleaning the slow cooker is effortless. Put the crock pot and lid into your dishwasher and you are done. Wipe down the housing inside and out with dishwashing detergent, rinse, and towel dry. Step 3.If you have crusty hard food stuck to your pot, make a paste of baking soda and water and scrub with a sponge, rinse, and towel dry. If you want, you can put the inside pot into the dishwasher after scrubbing off the dried hard food. You can use this paste gently on the heating element at the bottom of your cooker. You can also use a professional cleaning paste shown on Amazon for good results. Step 4. Let all parts and the slow cooker/crock-pot air dry for a few hours too before putting it away. Tip: Clean the slow cooker after each time it’s used; don’t wait until it’s a hard stuck-on mess before cleaning.